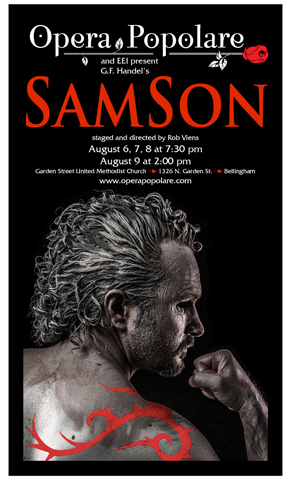 The Oratorio, Samson, by G.F. Handel, covers the events in the last day of the biblical Samson’s life, as portrayed in Milton’s poem, Samson Agonistes. The work is said to be Handel’s most dramatic oratorio, and is occasionally staged. 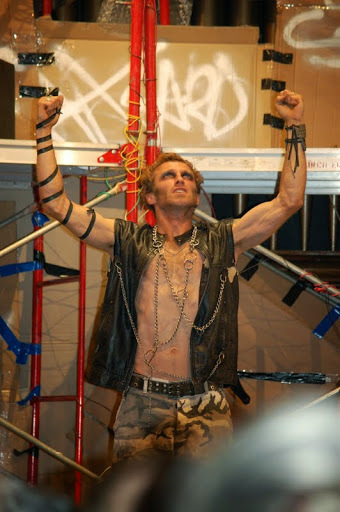 Rob Viens, Opera Popolare Stage and Music director, is staging the work in a post-apolcalyptic setting with costumes by Lori Childs assisted by Dorothy ChildsWeber and Katie Kennedy. Carlo Furlan, tenor, portrays Samson, and Serena Viens portrays Dalila. Lesley Rigg sings Micah, Samson’s friend; Wendy Donaghy sings Nashyan, an Israelite woman; Talia Rayne sings Achisha, a Philistine woman; Norman Hale sings Manoah, Samson’s father; Kyle Dalvit sings Harapha, a Giant of Gath; Monica Burlingame sings Aphra, attendant to Dalila; Karen Powers sings Abiyah, a messenger; and Dylan Kane sings Bedan, a priest. Members of the chorus include Dorothy Childs Weber, Laura Shelton, Wanda Maddox on soprano; Beth Fuller, Debra Davis, and Sue Rivord on alto; Anna Joy Walker, and Peder Fedde on Tenor; Brian Toews, Cody Vanderwerff, Fred Lund, Roger Clark on Baritone. The cast and chorus are accompanied by the nine-piece Opera Popolare orchestra. “This was the third Opera Popolare production I’ve attended. “Samson” was Spectacular! All the incredible Voices and the Chorus just swept me away! The Orchestra was phenomenal!!! The staging, costumes and set design was of the highest caliber. Clips from the preview performance.